Individuals with significant disabilities should have the same civil rights, choices, options, and control over choices in their own lives as do individuals without disabilities. Members of the Council shall be appointed by the Governor for three year terms. The INSILC members consist of individuals across the state with at least fifty-one (51%) being individuals with disabilities who are not employed by any state agency or Center for Independent Living. Other members may include parents and/or guardians of people with disabilities; advocates; people representing providers of services including Center for Independent Living (CILS); representatives from private businesses and community organizations; and representatives from state agencies. If interested, please review the Membership Invitation Letter and complete and submit to the INSILC Executive Director the Membership Application Form and Background Information Form no later then July 22, 2018. For more information, contact the INSILC Executive Director, Amber O’Haver. INSILC is established by the Rehabilitation Act of 1973 and is directed by the Independent Living philosophy. Section 701 of the Rehabilitation Act of 1973 promotes a philosophy of independent living, including a philosophy of consumer control, peer support, self-help, self-determination, equal access, and individual and system advocacy, in order to maximize the leadership, empowerment, independence, and productivity of individuals with disabilities, and the integration and full inclusion of individuals with disabilities into the mainstream of American society. INSILC’s Vision, Mission, and Values are driven by this purpose. Lead an effective statewide independent living movement resulting in people with disabilities living without barriers, fully integrated in society. To empower our peers with disabilities to lead and control their own lives. 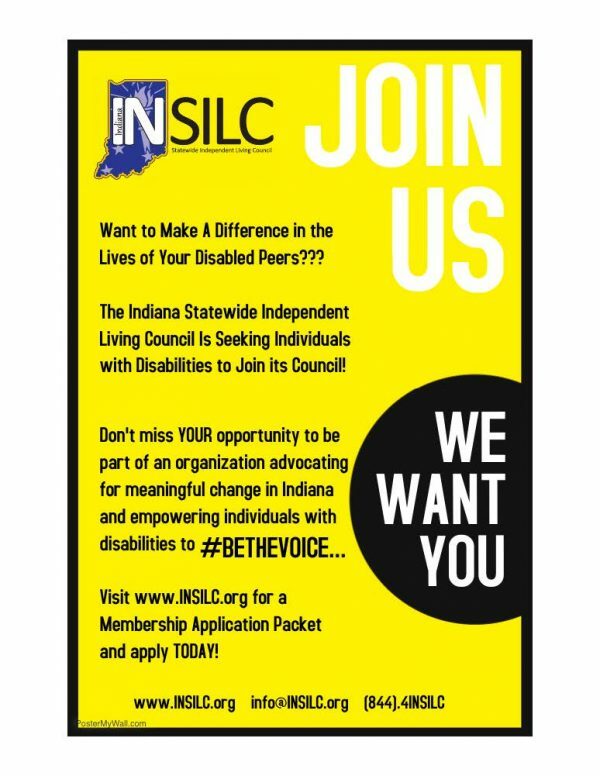 Members of the public are welcome to attend meetings of the Indiana Statewide Independent Living Council (INSILC). Meetings are currently scheduled for 2018. Audio will be voice over internet, so participants will need to use speakers or headphones to hear the meeting. Prior to the webinar, you can test your connection by logging in here. You will be prompted with any necessary updates or add-ons. Do not log into the webinar using Citrix or a Virtual Private Network (VPN). These services will not be able to playback audio.